These are not so much a recipe as they are a serving suggestion. A great benefit of making Mini Burgers is they are easy to have prepared ahead of time and make a fabulous informal dinner with friends, or even children. Every few weeks we have a Friday night festival of Mini Burgers, often with homemade chips and lovely bevvy or two. It is a fabulous opportunity to be as kitsch and as over the top as you like; the tiny size of these burgers lends them to some kitsch-en fun and using all those tiny serving dishes you are not sure why you bought! The great thing about Mini Burgers is everyone can build their own once the ingredients are spread out and there is room for lots of variety. Unlike their giant cousins (and heaven forbid, the fast food variety) it is possible to have a couple of these little chaps and remain relatively healthy if you choose – if you make a batch of Vege Burgers at the same time, it is even beast-free friendly. 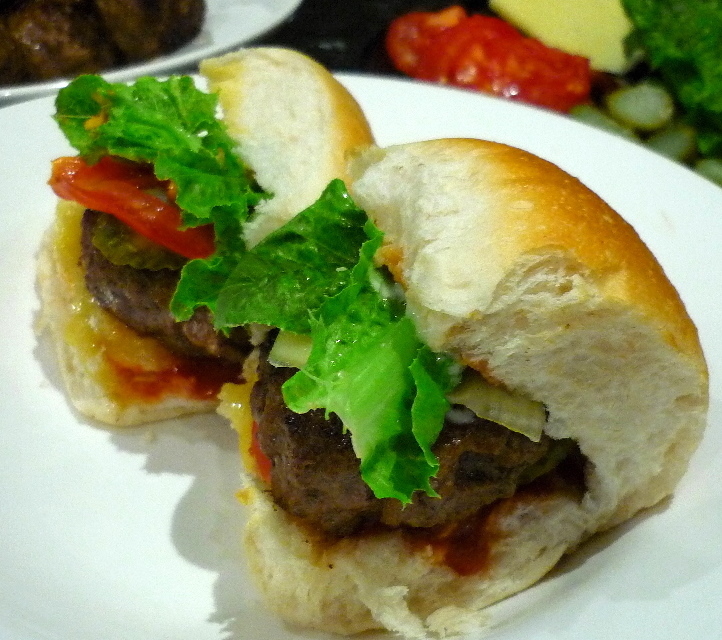 Quantities here make around 24 little patties, perfect for a shared dinner or as left overs! To make the patties, combine all the ingredients in a large mixing bowl and massage together until the meat becomes sticky. Form into palm-sized patties, pressing down fairly flat. On a very hot skillet, cook the patties quickly on each side to give plenty of good smokey colour, then place on a baking sheet lined with baking paper. Cook in a fairly hot oven for 15 minutes, then check. 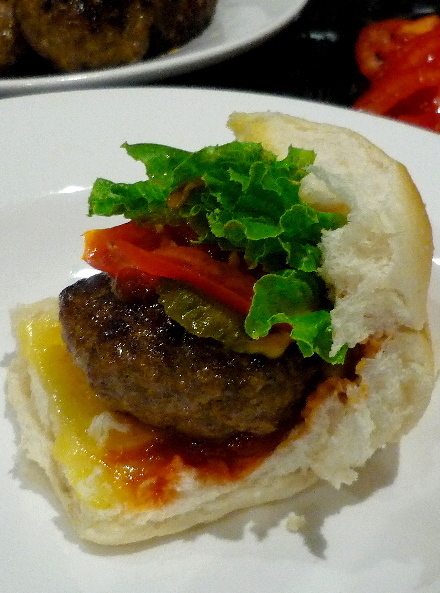 If liquid has seeped from the patties, drain this off and return the patties to the oven for a further 10 minutes. While the patties are cooking, prepare the added extras! Mustard – posh, seeded, or just the yellow squeezy bottle variety, it is all good! Mayonnaise - really there is no cause for the high faluting homemade variety here unless you are going all out gourmet. Tomato sauce – obvious really! Polski Ogorki pickles – for me there is no burger without pickles! Cheese – as basic as you like, or as posh as you like. Personally, I think a slightly melted slice of tasty on the base of the bun is a cracking plan. Bacon – no explanation necessary. Onions – cooked until they are caramelised and sticky, yum. Egg – due to the mini size of these little chaps eggs are a bit tricky. If you are on that gourmet burger trail, go crazy and fry a couple of quail eggs, your dinner guests will be heartily impressed and amused. Dinner rolls – we have made these with a vast variety of buns and I can wholeheartedly say the tiny little dinner rolls are the best option, the softer the better. Pop them in the oven wrapped in foil just before serving and they become delightfully fluffy. Once you have your patties ready, your buns warmed and your plethora of tasty titbits ready to go, line them up along a counter top or table to allow everyone to pick and choose the ingredients they prefer. Serve with homemade chips and a suitable cocktail of your choice!